Shirts With Random Triangles: Southern Miss release Hype Video for C-USA Championship Game. Southern Miss release Hype Video for C-USA Championship Game. Ready for a Conference Championship Week hype video? 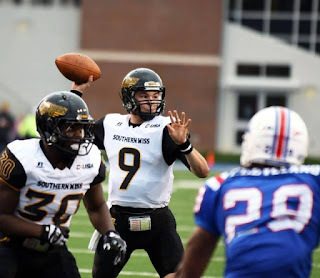 Southern Miss is going to be taking on Western Kentucky in the Conference USA Championship game on Dec. 5. The Golden Eagles dropped a hype video for the game on Tuesday.